It's very easy to do yourself, and it 100% works! I have used this to get rid of Carpenter bees my whole life. You will need a can of WD40 spray, the one with the long sprayer tip at the end works best. Spray the WD40 into each bee hole. Spray a pretty good amount, and the bees will fall out and die. This will keep the bees gone all year long. With all of our valuable bees dying off because of chemical toxicity, you should look to re-home the bees to a more desirable location instead of killing them off. 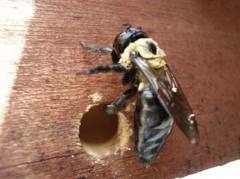 Even carpenter bees play an important part in plant pollination. I would love to - or pay someone to do it... do you have any recommendation? I have gone through 2 WD40 cans already and have ordered 3 more from amazon as that is how large my infestation is. (Huge deck, ignored the one or two bees in previous years, now it's beemageddon!). But so far I have killed about 40 bees with the 2 cans of spray. The nozzle on the can doesn't work so good when you need to hold the can upside down to get into the holes and your can is almost empty...I've ordered some of the Best Bee Bros traps too and hope that will finish them off. Don't kill the bees repel them.I have them as well but I don't kill them. How do you naturally repel carpenter bees? Could you please send me your mailing address so I can send you all my carpenter bees so they can enjoy destroying your home instead of mine? 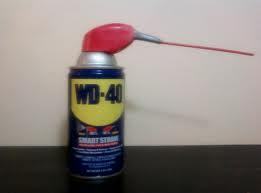 WD 40 works GREAT! After spraying into their holes they back out, hit the ground and die. You can get the ones returning to nest with a good fly swatter that'll knock them out of the park. A good stomping is suggested after they hit the ground. WD40 works like a charm.